Cork Kerry Community Healthcare today urged all healthcare workers and people in at-risk groups to get the flu vaccine, as figures show that seasonal flu vaccine uptake rates amongst staff working in the health services last year were at the highest ever levels. 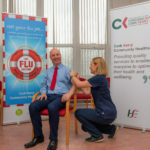 Minister for Older People and Mental Health Jim Daly today (Monday October 8th) received his vaccination at Clonakilty Community Hospital, launching the flu vaccination campaign in Cork Kerry Community Healthcare. Minister Daly urged people working in healthcare settings to get the flu vaccine. Last year saw an increase in the number of healthcare workers receiving the flu vaccine and Minister Daly said he is keen to see this continue this year. “Uptake of the flu vaccine by healthcare workers is an essential step in preventing the spread of flu to the older people they care for on a regular basis,” he said. Community hospitals and other Cork Kerry Community Healthcare facilities across both counties are holding peer vaccination clinics so that staff can easily receive their vaccine, administered by their peers. 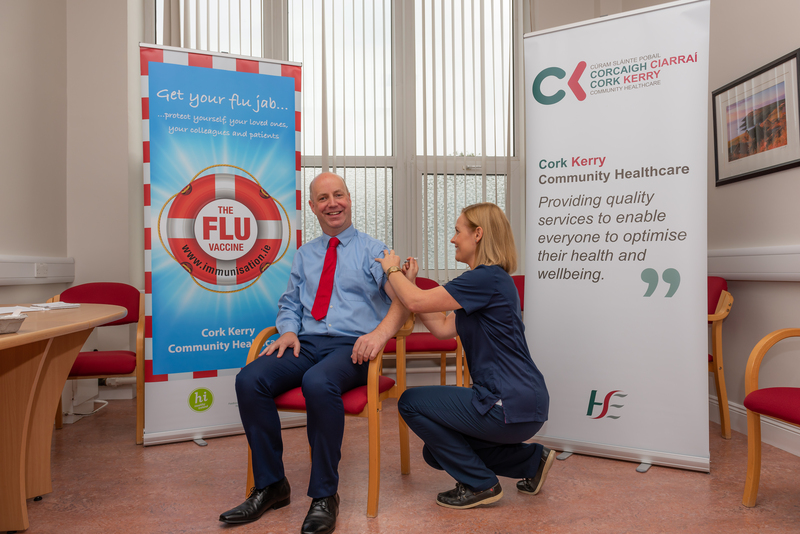 Ger Reaney, the Chief Officer of Cork Kerry Community Healthcare, thanked the many staff who have already gotten the flu vaccine this year, and asked all staff to consider getting this vital protection. “Healthcare workers are 10 times more likely to be exposed to the flu. They can have the flu and have no symptoms. This means they are unaware that they are spreading the flu to patients, colleagues and taking it home to their families and loved ones,” he said. Jennie Synnott, the flu lead for Cork and Kerry Community Healthcare said she has personally seen the impact of a flu outbreak. “In 2016 I experienced an outbreak in the unit I was working in, and I never want to see patients and staff that ill again. I also don’t want to be responsible for spreading the virus to people I care for, to my colleagues or to take it home to my family. That’s why I get the vaccine, and why I’m encouraging all staff to get the vaccine too. It’s the best way to stop the spread of the flu,” she said. There was an increase in the level of uptake among healthcare workers in Cork and Kerry during the 2017/2018 flu season, and all staff are asked to consider getting the vaccine. By getting the vaccine, healthcare workers protect themselves, the people they work with and their loved ones. In the 2017/2018 influenza season, at least 100 children were hospitalised across Cork and Kerry because of the flu, while sadly at least 24 people died in the two counties. For staff in areas where peer vaccination clinics are not available, the vaccine is available free of charge from their local Occupational Health department. Cork Kerry Community Healthcare and the HSE are also urging people in high-risk groups to get their flu vaccine – it is the only defence against the flu and provides vulnerable people with protection against the life-threatening complications of flu. At-risk groups include: those aged 65 years and older, people (including children) with long term medical conditions, all pregnant women, those in regular contact with pigs, poultry or water fowl and residents of nursing homes or long-stay facilities. People in these groups can get the flu vaccine free of charge (people without medical or GP visit cards may be charged an administration fee). · Further information is available on www.hse.ie/flu and www.hse.ie/corkkerryflu. · Advice, tips, information and videos on getting over flu and other common illnesses are available at www.undertheweather.ie.